Here's my pic for the week. We procrastinated a bit in taking down the holiday decorations, but finally got it finished late last week. I was a little sad to see them go, as usual, but it is a relief to have less clutter.This is my girl looking out our front window waiting for daddy to return from running errands. You can still see the wreath on the front window, and it almost looks snowy out with the blownout window. While is has been cold here and gray, we've yet to see any snow this year. What a gorgeous child! Her gaze out the window... Makes you wonder what she's thinking. Ah! Taking down the holiday decorations is my least favorite part of the season. Good Luck with that task! Oh my gosh! Her reflection in the glass - to die for!! So happy you're joining us! I love this photo. So sweet. Love the light in this shot. She's a living doll. What a doll! Her curls kill me! Looks like we had a similar thought! :). Love the girl, the light, the reflection! what a beautiful child...those curls and that expression are stunning!! It's as if she's watching the holidays disappear. Beautiful portrait, reflections and the choice of BW works really well. Fabulous!!! I have got to get back to trying things again. I have been meaning to do window shots for a long while. This is so inspiring. WOW...Love this...And what a cutie pie! Another stunning, stunning image, Melissa! Absolutely ♥♥♥ this. Oh!...you have such a cute little princess. She must be thinking where her daddy has gone. 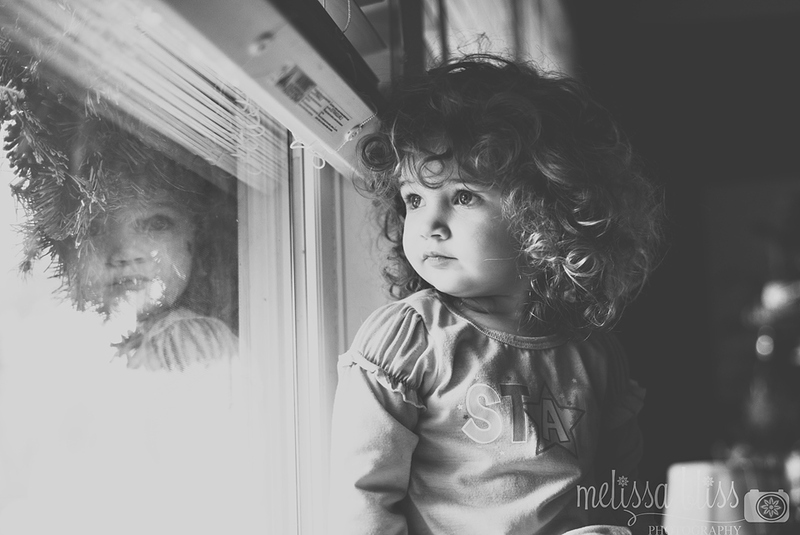 She truly looks like a little angel, Melissa, and that reflection is wonderful.